Chelsea Clinton is expecting her third child with financier husband Marc Mezvinsky, she says. The couple — whose daughter is 4 and whose son is 2 — married in 2010. Financier? I thought his company went belly up after he lost his investors' money (not that he actually has to work, I know, as long as the Clinton Foundation is still in existence). Any of those baby's look like their biological grandfather on their mothers side?. Let us not use political crassness that could appear on this thread. 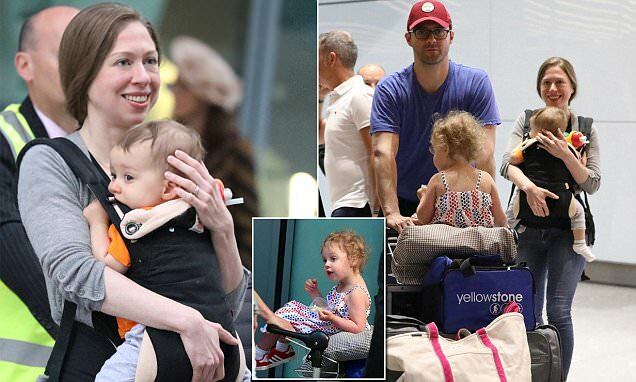 Chelsea did not choose her parents. She is brave to have three babies, from the physical process going though three births, to being responsible for three little ones day after day until they are grown, and then it still doesn't end; it is the rest of her life, as we mothers know. Chelsea was and is, what she wants to be with support of her husband and her parents. She is lucky to have the opportunity she has. Tell her to start her own web site more suited for her puritan tastes. Dunno. But their mom sure as hell looks like her dad! I wish them a healthy baby. Her connection to the Clinton Foundation Criminal Enterprise makes her newsworthy. And she's the one who announced her pregnancy, so it's hardly intrusive of us to discuss the news. That's not the way it works. The COMPANY and the INVESTORS are the ones that lose the money,not the management. Management are the only ones involved that have none of their own money invested. What daffy eff would stick it in this fugly creep not once, not twice but three times? Page created in 0.654 seconds with 21 queries.